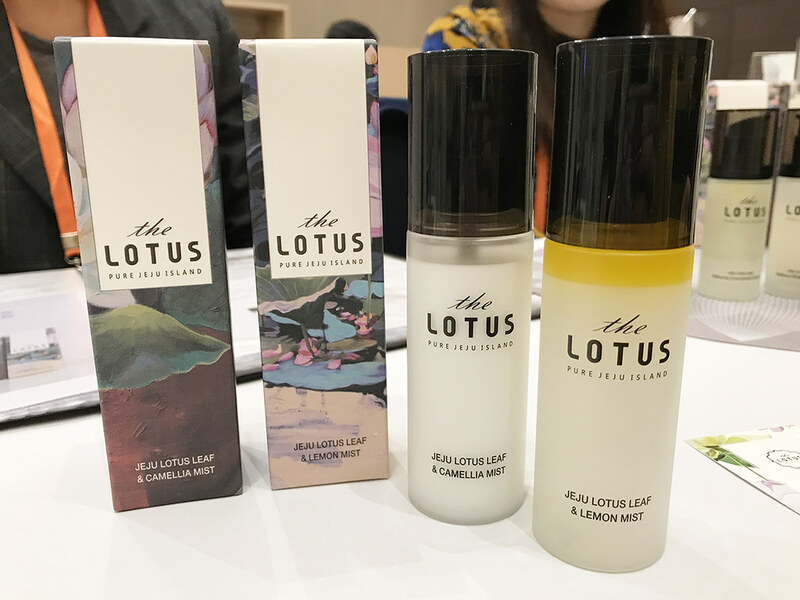 One of Jeju Island’s most treasured local brand is [The Lotus], whose main ingredient in its skincare products is pure, natural white lotus leaf extract harvested from a pond at a legendary Buddhist temple, the Beophwa Temple. With products that aim to whiten, brighten and counteract effects of aging, [The Lotus] has gained popularity not only in South Korea, but also globally, especially the United States of America. The skincare range contains water-soluble Vitamin B3 and Adenosine for the aim of preventing melanin from forming while improving the appearance of fine lines and wrinkles. What’s also unique and special about [The Lotus] is the packaging! 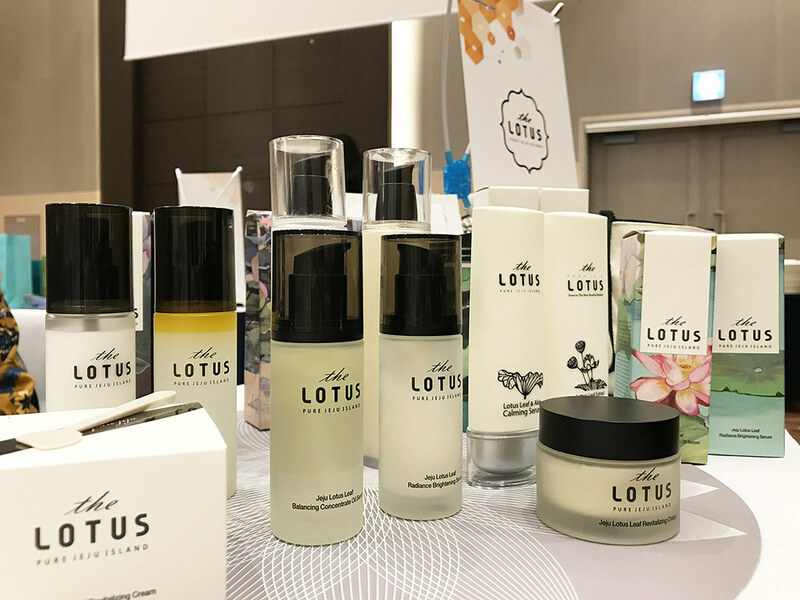 Each of the products come with a gorgeous packaging which is illustrated by the island’s very own artist, Kang Myung Soon, who only drew lotus flowers for over 20 years. I personally tried the Lotus Leaf Mist Set, which contains the Lotus Leaf & Lemon Mist and the Lotus Leaf & Camellia Mist. They smell super rejuvenating, which is great for a midday skin refresh! If there’s A Concept you need to know, it’s definitely A:Concept! 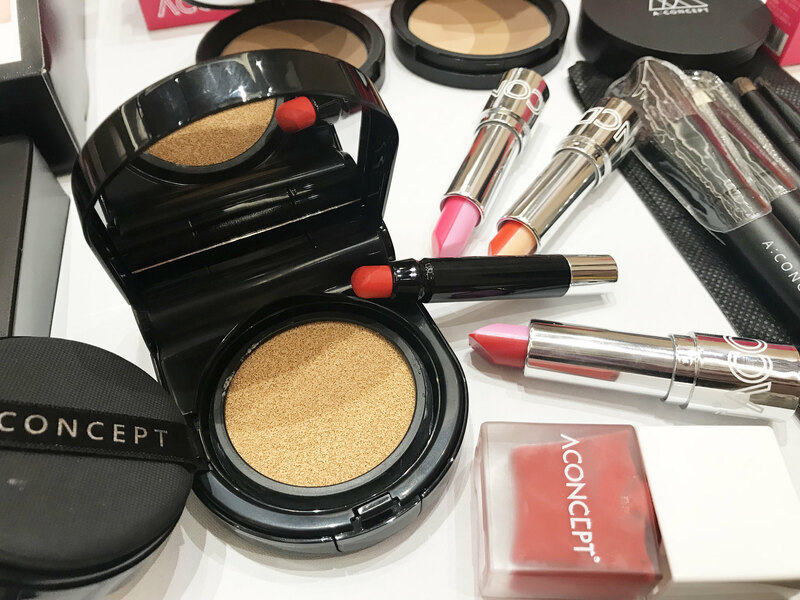 *Pun intended* A:Concept is a Korean cosmetics brand featuring makeup products for easy and quick application, especially for those who don’t have the luxury of time. This K-beauty brand is also Girls’ Generation’s Taeyeon’s No. 1 Makeup Secret! 3 things you have to try from this brand is the All In One Brightening A:Cushion, which cleverly comes with a lip & cheek crayon, Cheek Me Cheek Tint and the Chewing Two-tone Tint Lip Balm. You just need all 3 for you to look put-together in the shortest time. “Beauty starts from you. Just believe,” is makeup artist, Jung Saem Mool’s mantra. 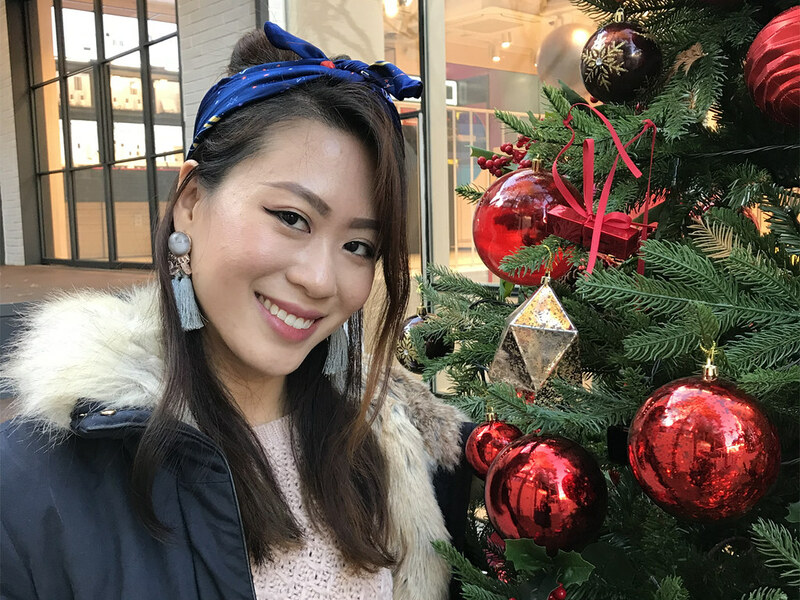 Her beauty products were developed from her experience and through the consideration on how makeup applies on each person’s skin type, bone structure, face line, colour and shape. I personally swatched a couple of eyeshadows, blushers and lipsticks and found them to be really high quality! It’s like the Korean version of NARS. I really wanted to get one of everything but I had limited budget so I got her famous lip tint in the limited edition packaging, the Artist Red Edition – High Tinted Lip Lacquer. It is soooooo super lasting yet non-drying! I’ll definitely be back for more if I have the chance. This is one dish you’ll want to have in the cold. It was 1 °C, and all we wanted to do was to have some Korean Ginseng Chicken Soup after we touched down. 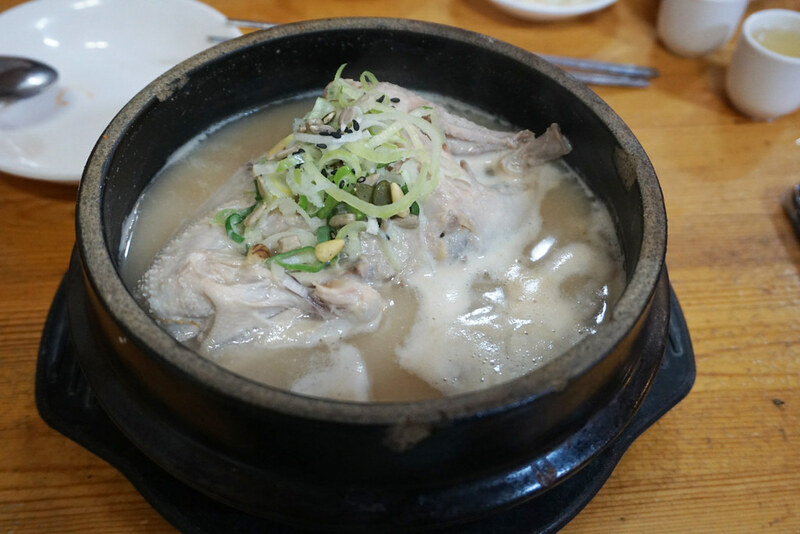 The most famous one is none other than Tosokchon Samgyetang (토속촌 삼계탕), located near Gyeongbuk-gung. Touristy it might be, this place serves one of the best sam gye tangs in my opinion. 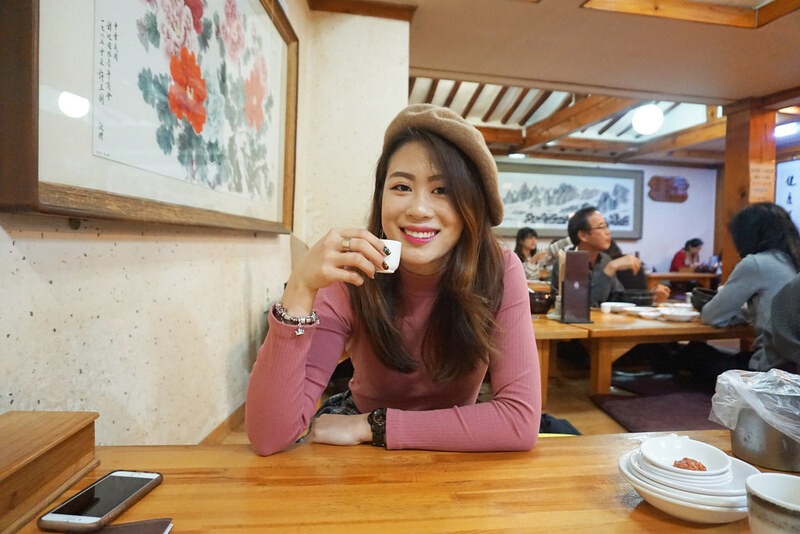 I really enjoyed eating in the traditional Korean house with the classic Korean ginseng chicken stuffed with glutinous rice, gingko nuts, ginseng, garlic and jujube, as well as 30 different types of medicinal herbs and grains. The chicken was so tender too and the soup? Simply delicious. 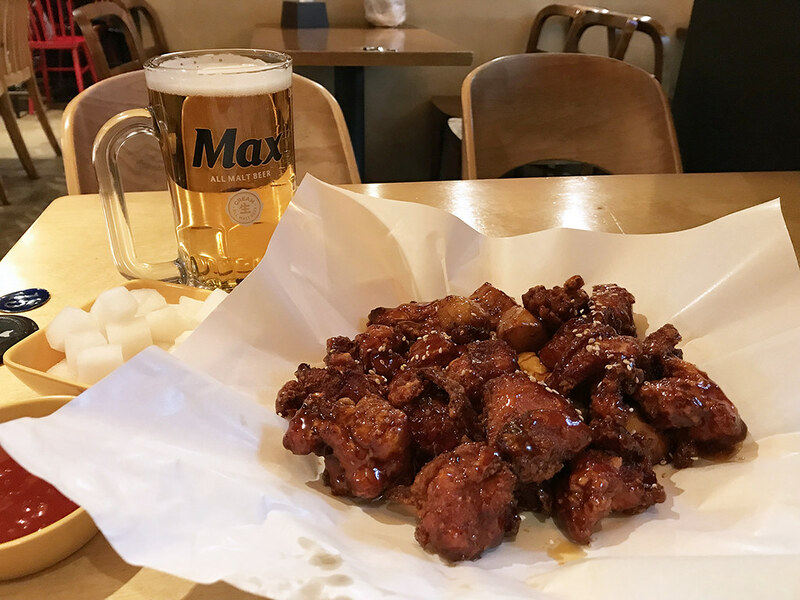 It was the last day of my trip and I really wanted to have me some Chi-maek – Korean Fried Chicken (Chi-kin) and Beer (Maekju). Lucky me, there was one right across the street of my hotel, called Kkanbu Chicken. Even though it was a Saturday evening and the place wasn’t crowded, I gave it a try because there were no other Chi-maek shops around. Little did I know after staying there for about an hour, the restaurant was full! Anyway, I ordered a pint of Hite Beer with my Sweet Fried Chicken and I love it! The fried chicken were in decent sizes, fried to perfection and coated with a spicy and sweet sticky sauce. While I was going through the ginormous basket, I realised there were fried potatoes and rice cakes too! It was truly a hearty solo dinner I had and I would definitely go back again. Alright, I know that this one is highly controversial but you know, you only live once, #YOLO, so I went ahead to try this. 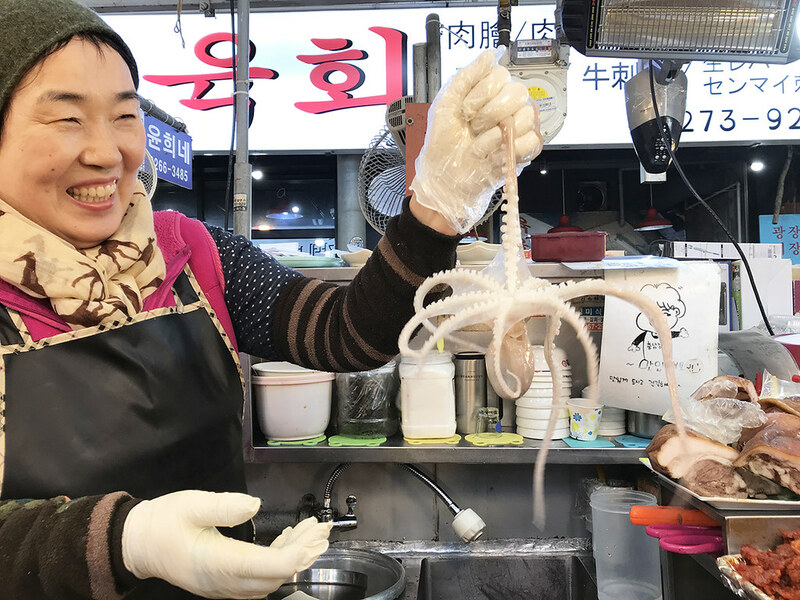 San Nak-ji, live octopus, is an exotic delicacy served in South Korea. 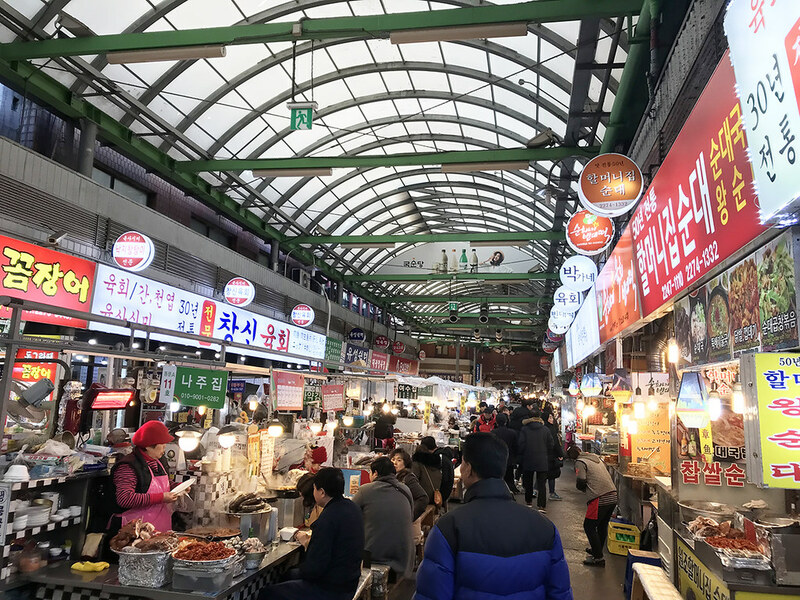 You can get it from almost every food vendor in Gwangjang Market. 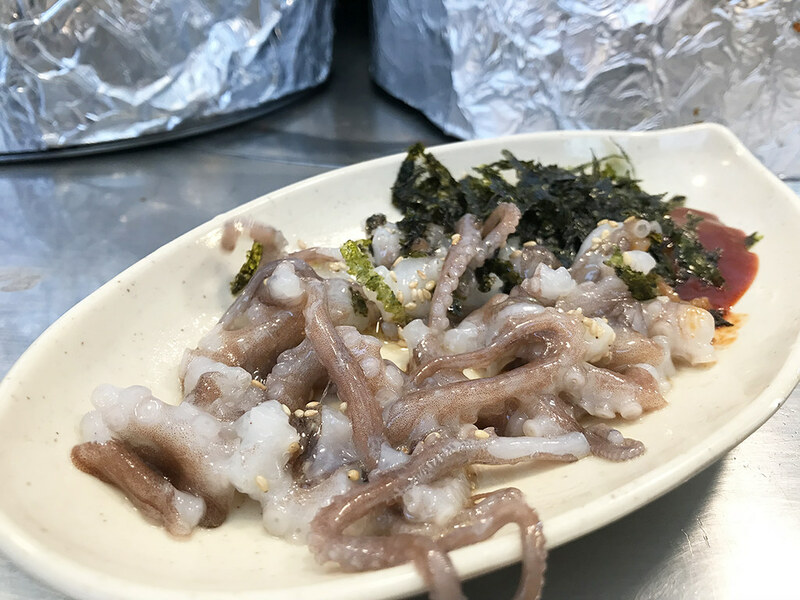 From what I know, it isn’t really “live” per se because the octopus’ head is being chopped off right before you eat the chopped tentacles. The nerve activity require some time to die down so the moving tentacles may seemingly look alive. Well, I will show you a video of me eating it so you’ll understand that it really isn’t as scary as what others say. 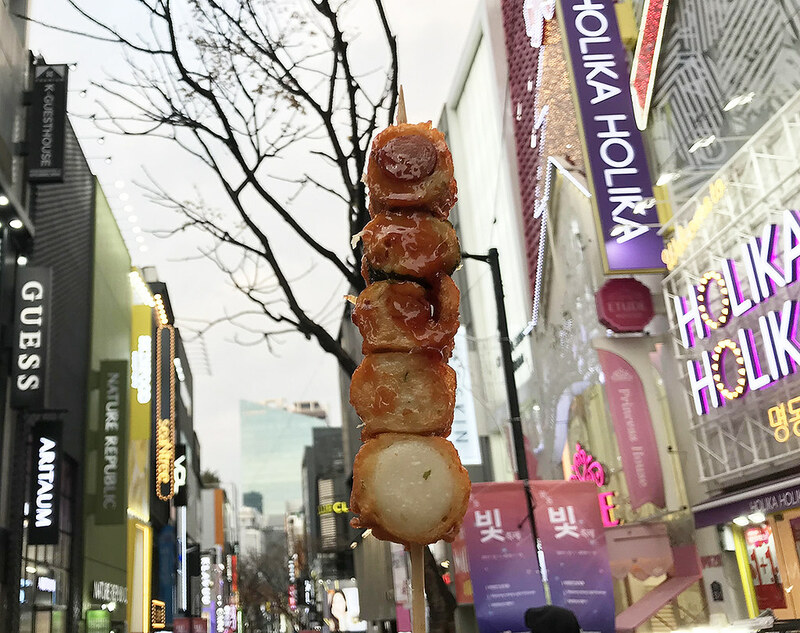 Tteokbokki or Korean Rice Cakes, is a must-try when you are in Korea. We stumbled upon this place while searching for our first meal of the day and boy, we were grinning from ear to ear after the meal! Talk about fusion food. 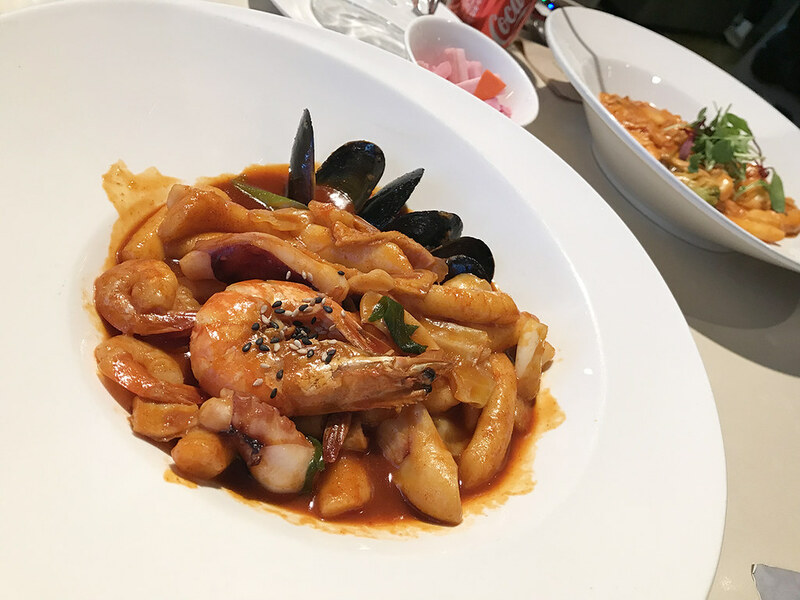 Villa de Spicy is a restaurant serving tteokbokki done in all ways – from the traditional sweet and spicy ones to those with interesting pasta sauces. I tried the traditional one with seafood while Xinyi had a tomato cream based one and we were totally blown away by the quality of food. Even though mine was really quite spicy, I managed to finish off my plate because it was so yummy. Oh and you also have an option to design your own tteokbokki stew too. It’s a great place to visit especially with friends because you can totally have a fusion rice cake party! This whole area/street is totally Insta-worthy. The name translates to tree-lined streets and was given because the area is adorned with ginkgo trees (fun fact!). Walking down the streets, you’ll be able to find many cosmetics shops and hipster cafés for your photos! There’s Jung Saem Mool which has a pretty garden before you enter, Skinfood with its cute yellow van parked outside the shop and Osulloc for its rustic charm and many more. 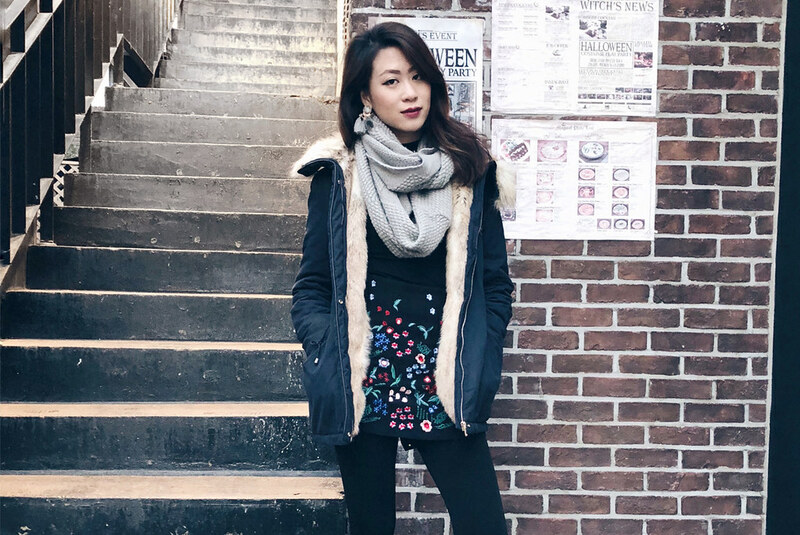 Explore the different alleys as well to discover different back drops to fit your style. We even saw a model in the midst of a professional shoot in one of the white-walled alleys! Hongdae and Myeongdong are well known for shopping, especially for fashion and beauty. These streets are lined with cosmetics and fashion shops, one after another, it was practically hard to navigate! It’s a bit tricky because you really have to dig the alleys and cafes. This last one here is all about nature. 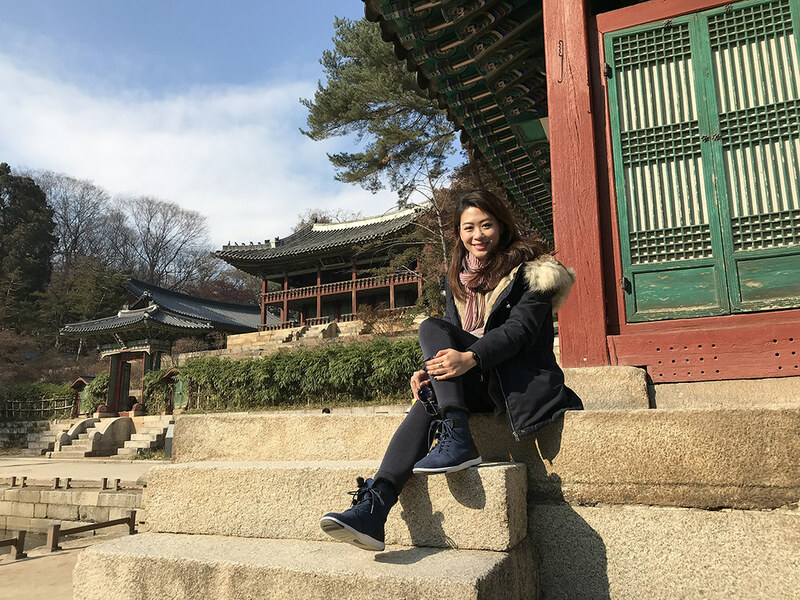 During my last day of stay in Seoul, I just wanted some peace, away from the hustle and bustle. 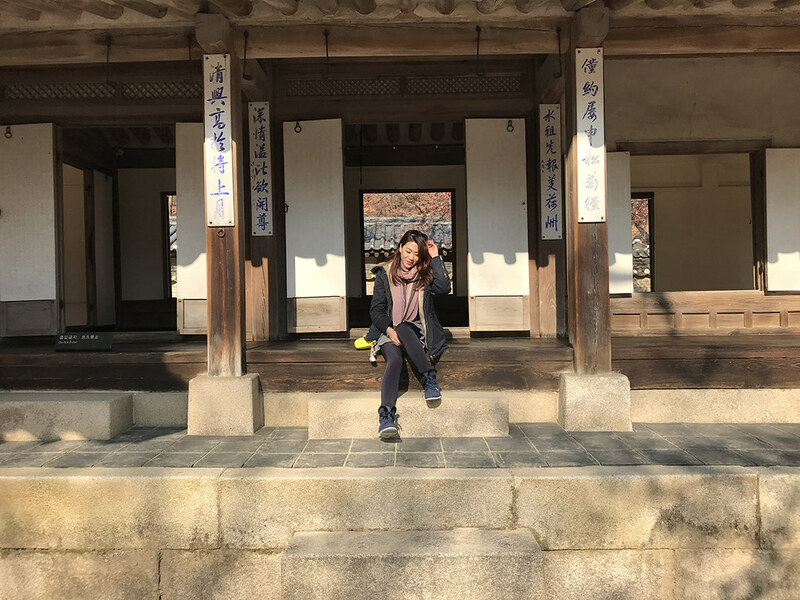 Hence, I took a trip down Changdeok-gung & Bukchon Hanok Village for a scenic experience. 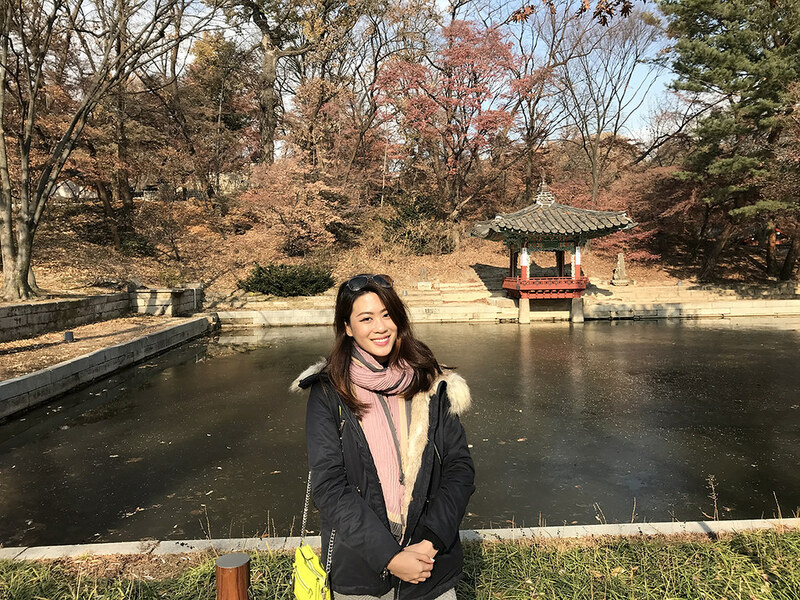 Changdeok-gung is set within a large park in Jongno-gu, Seoul, South Korea. 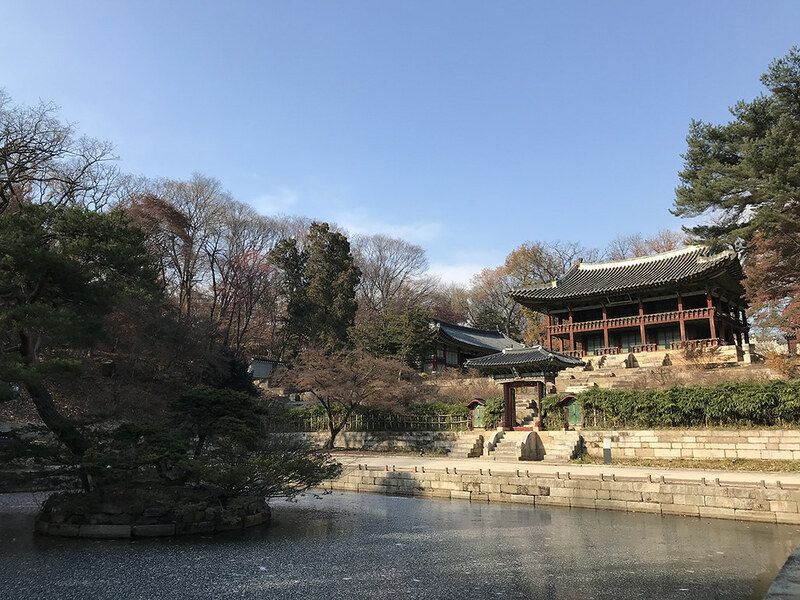 It is one of the “Five Grand Palaces” built by the kings of the Joseon Dynasty and has a gorgeous garden – Secret Garden. 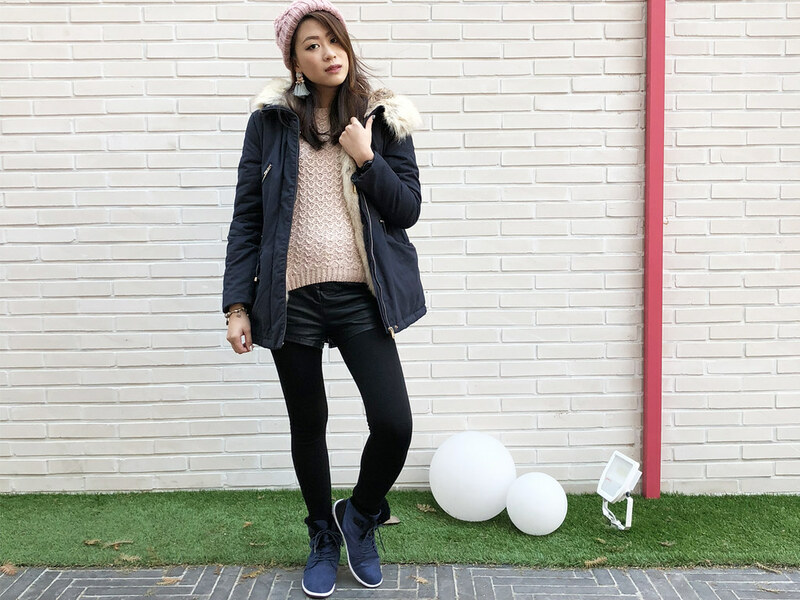 This is worth visiting because you can seriously take all your OOTDs with the ancient architecture, frozen ponds and rich foliage. Try renting a traditional Korean Hanbok to amplify your experience! 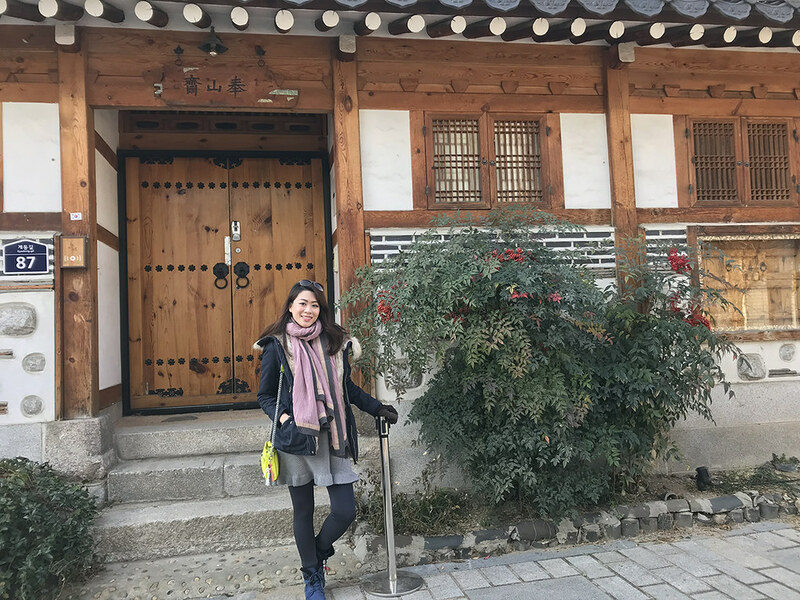 I walked over to Bukchon Hanok Village after spending a solid 2 hours in the palace, in search for some food. Little did I know that every turn is a photo spot? 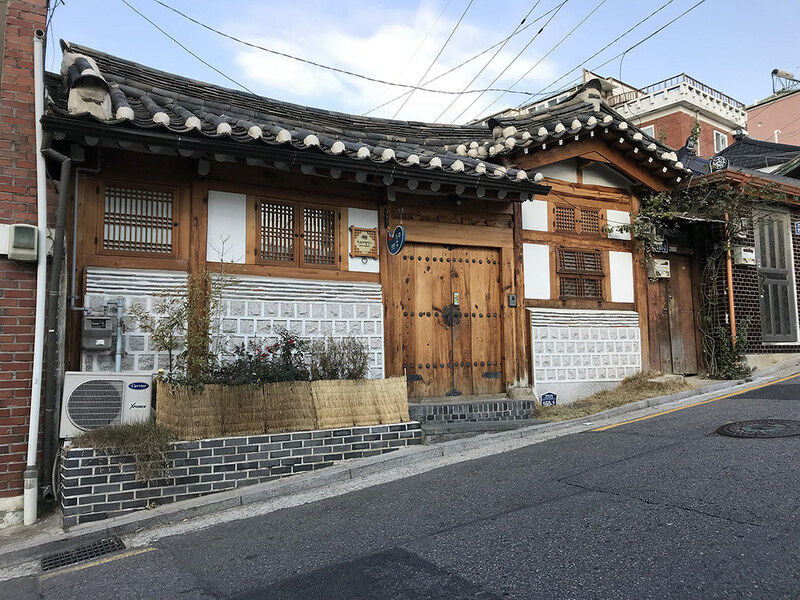 The traditional village is composed of lots of alleys, hanok (Korean wood) and is preserved to show a 600-year-old urban environment. Indeed a nice place to visit. 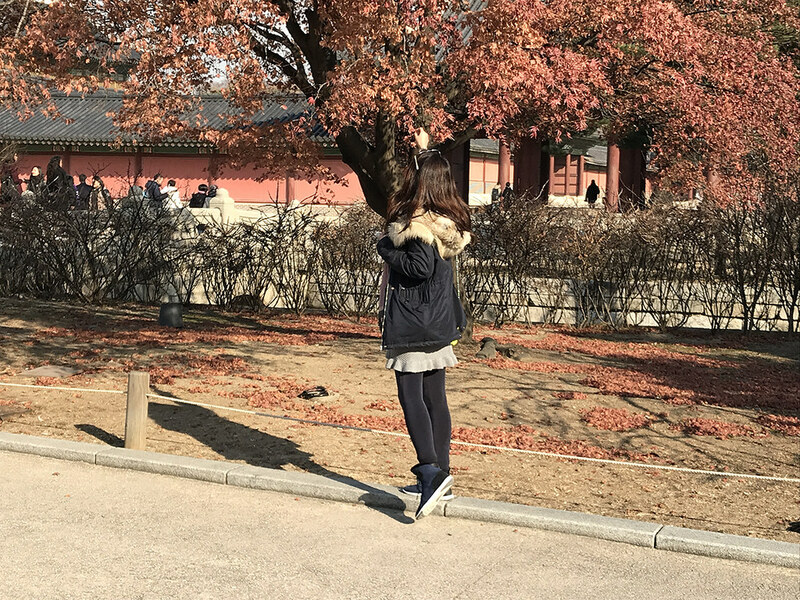 There were definitely much more that I’ve encountered in my Seoul-searching trip, including witnessing my very first snowfall! It was such a light one I couldn’t take photos but nevertheless, it was a good one. J I also did stupid things with Xinyi, including going to the convenience store next door with only PJs in sub-zero temperatures. Watch the video below! That sums up my 5D4N trip! 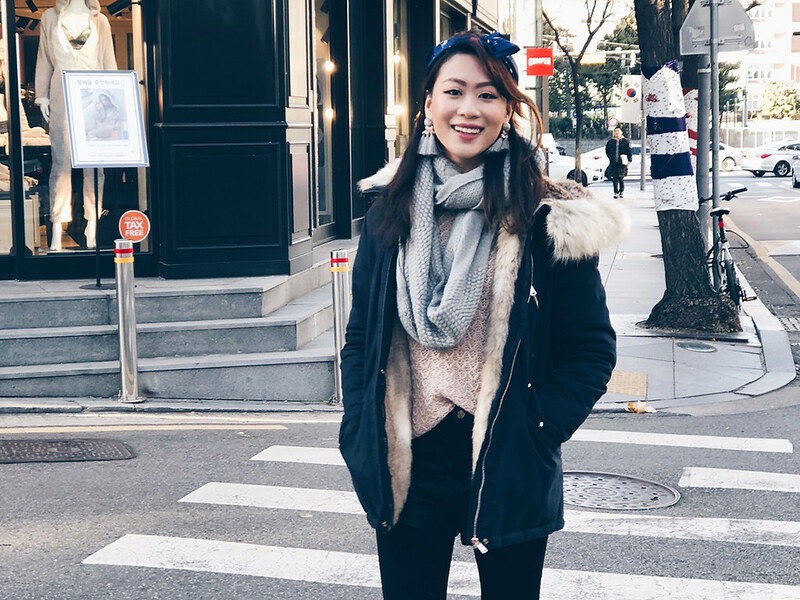 Hope you like my #ParadeofAdventures to Seoul~ Don’t leave this space and watch out for a style challenge that Xinyi and I did in Hongdae! Have you been to Seoul? Any recommendations?